The most powerful MRI machine in the world is nearing completion. The new instrument will be able to generate 11.75 Tesla, a field strong enough to lift 60 metric tons. Squeezing out those last few Tesla (the previous record for field strength was around 9.4) requires extraordinary precision in the design and manufacture of the superconductor magnets at its core. As a recent article in IEEE Spectrum reports, fields of this magnitude are stronger than those used in the Large Hadron Collider which famously discovered the Higgs boson. As a research tool, a machine like this would allow the brain to be imaged in unprecedented detail—a voxel size of .1mm as compared to 1 mm previously. But as medical device makers struggle to design implants that won't move, heat up or otherwise fail in fields of that strength, the opportunity for new discovery in the brain, will by guided also by a few new challenges to be overcome. MRI machines normally image the relatively strong signals associated with the nuclei of hydrogen. With higher field strengths it is possible to image signals from sodium or potassium, the ions that are also among the most mobile in carrying the charge associated with spikes in neurons. An area of 0.1mm still might have over 1000 neurons so this technology is not going to be imaging neuron activity individually. It may however, provide recent efforts to decode the private imagery associated with our inner thoughts and dreams with much greater accuracy than current methods. While a recent paper in Nature contains an air of optimism regarding the progress of the decoding algorithms used in these kinds of studies, cautionary tales regarding the interpretations of the results still abound. The 270 million dollar scanner project, know as INUMAC (Imaging of Neuro disease Using high-field MR And Contrastophores), has been in development for the last seven years. Delivery was taken this summer of some 200 km of superconducting niobium-titanium wire. When cooled with superfluid helium to 1.8 Kelvins, this wire will be able to carry 1500 amps. 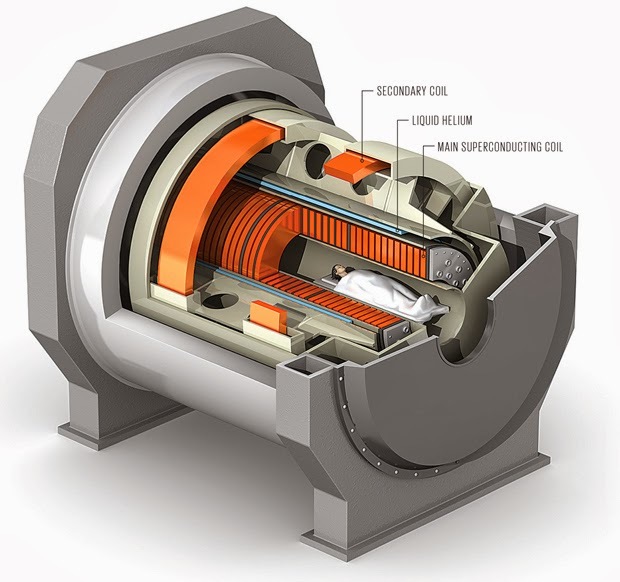 The key to making a magnet that won't melt or vibrate itself apart, is a new winding design that permits the helium to get where it needs to for cooling, and also provides for winding alignment to micrometer precision. Today electromagnetic devices, like precision servomotors, are no longer wound willy-nilly like a random spool of yarn, but rather put together so that each turn is in the proper place. The idea is that entire electromagnet hums coherently as a whole and creates a uniform field. A more expensive wire material, niobium-tin, would in theory carry enough current at the same diameter to create fields up to 20 Tesla, but it is much more brittle than niobium-titanium and difficult to wind. Pushing field strengths ever higher raises a few concerns. Implant manufacturers, like Medtronic, have a tough job to do to insure the safety of their devices inside magnet bores. One indicator of the gravity of the situation, is that they have taken to naming their devices according to their tolerance of fields strong enough to turn gas cylinders in adjacent rooms into guided missiles. Their SureScan pacemaker comes with guarantee of MRI compatibility—at least up to certain fields strengths, and their spinal cord neurostimuluators, commonly used to subvert chronic pain, come with documentation that doesn't shy away from some hard-core physics. For example, an MRI system generates three kinds of fields, each of which have different potential for interaction with a device. The static fields are present at all times around the magnet, while the three orthogonal gradient fields kick in only during the scan. A pulsed RF field is also present during the scan, and is created by a variety of different methods. We might note here that when an airplane takes-off or lands, powering down your devices in the face of the unknown is only a nuisance. Powering down an implant, if it is advised, may have more inconvenient consequences. A final cautionary tale before leaping in to one of these new machines, is that the effects of double-digit field strength on the tissues of the body itself are not completely understood. Computer models and simulations will be invaluable in setting guidelines here, but ultimately the proof is in the pudding. Physical tests will be needed, both as reality check for the things missed by the model, and also to help indicate areas perhaps where the models might be too restrictive.